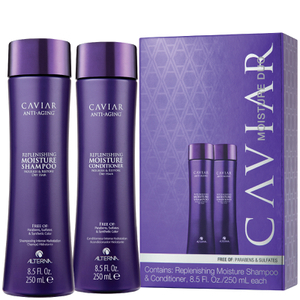 The Alterna Caviar Volume Duo Set combines a body-building shampoo and conditioner to elevate hair's natural volume. Plumping the appearance of hair, both formulas contain a Marine Plumping Complex that blends naturally volumizing botanicals for visible results. 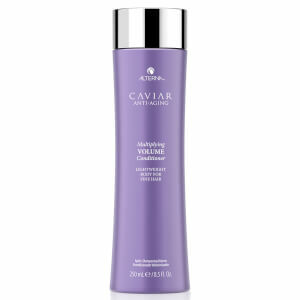 A volumizing shampoo that expertly cleanses while adding weightless volume and body to your tresses. The gentle shampoo lifts away build-up and impurities while promoting a plumper, thicker and healthier-looking, full-bodied appearance. Helps hair retain moisture. 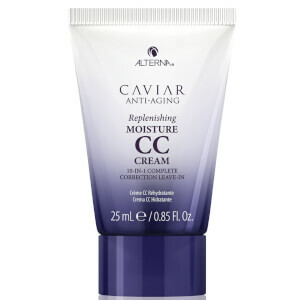 Enriched with Caviar Extract and a Marine Plumping Complex (a blend of naturally volumizing botanicals, including Sea Kelp and Biotin to help thicken the look of hair both instantly and over time). A body-building conditioner formulated to amplify the look of hair's volume. Enriched with Caviar Extract (one of nature's richest sources of Omega-3 Fatty Acids) and a Marine Plumping Complex, comprising a blend of naturally volumizing botanicals, including Sea Kelp and Biotin to help thicken the look of hair both instantly and over time. Hair feels nourished and plumped. Shampoo: Water/Aqua/Eau, Cocamidopropyl Betaine, Sodium Methyl 2-Sulfolaurate, Disodium 2-Sulfolaurate, Sodium Methyl Cocoyl Taurate, Lauramide MEA, Acrylates/Vinyl Neodecanoate Crosspolymer, Glycereth-26, Caviar Extract, Alaria Esculenta Extract, Helianthus Annuus (Sunflower) Seed Oil, Macrocystis Pyrifera (Kelp) Extract, Linum Usitatissimum (Linseed) Seed Oil, Butyrospermum Parkii (Shea) Butter, Keratin, Hydrolyzed Keratin, Biotin, Phospholipids, Saccharomyces/Magnesium Ferment, Saccharomyces/Copper Ferment, Saccharomyces/Silicon Ferment, Saccharomyces/Zinc Ferment, Saccharomyces/Iron Ferment, Hydrolyzed Vegetable Protein PG-Propyl Silanetriol, Superoxide Dismutase, Ascorbic Acid, Polysilicone-15, Tocopherol, Glycerin, Panthenol, Sodium Lauroyl Sarcosinate, VP/DMAPA Acrylates Copolymer, Cetrimonium Chloride, PEG-150 Distearate, Disodium EDTA, Citric Acid, Butylene Glycol, Tetrasodium EDTA, Phenoxyethanol, Potassium Sorbate, Hydroxypropyl Cyclodextrin, Silicone Quaternium-8, Silicone Quaternium-16, Benzalkonium Chloride, Undeceth-11, Butyloctanol, Undeceth-5, Iodopropynyl Butylcarbamate, Methylchloroisothiazolinone, Methylisothiazolinone, Fragrance (Parfum). (10-16-35470). Conditioner: Water/Aqua/Eau, Cetearyl Alcohol, Stearamidopropyl Dimethylamine, Glycerin, Dimethicone, Behentrimonium Methosulfate, Cetrimonium Chloride, Phospholipids, Caviar Extract, Alaria Esculenta Extract, Helianthus Annuus (Sunflower) Seed Oil, Glycine Soja (Soybean) Oil, Macrocystis Pyrifera (Kelp) Extract, Linum Usitatissimum (Linseed) Seed Oil, Butyrospermum Parkii (Shea) Butter, Keratin, Hydrolyzed Keratin, Biotin, Saccharomyces/Magnesium Ferment, Saccharomyces/Copper Ferment, Saccharomyces/Silicon Ferment, Saccharomyces/Zinc Ferment, Saccharomyces/Iron Ferment, Hydrolyzed Vegetable Protein PG-Propyl Silanetriol, Superoxide Dismutase, Polysilicone-15, Panthenol, Tocopherol, Tocopheryl Acetate, Ethylhexylglycerin, Ascorbic Acid, Butylene Glycol, Polyimide-1, Hydroxyethylcellulose, Guar Hydroxypropyltrimonium Chloride, Disodium EDTA, Citric Acid, Phenoxyethanol, Sodium Benzoate, Potassium Sorbate, Fragrance (Parfum). (10-16-34985).